We carry a full line-up of the finest commercial and residential roof vent and attic ventilation products - all tested in extreme climates. 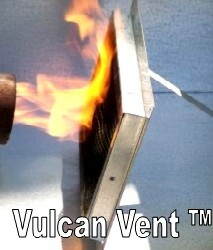 Our venting products include the fire stopping "Vulcan Vents" for all types of house vents, Accuvent interior-attic vent baffles, gable vents, retrofit base flashings for all roof vents, soffit, foundation and eave designs; solar powered roof vents, Ridge Vents and VariaVents for Tiles roofs, bathroom exhaust roof vents, flat roof vents, Eave Vents, Under-eave Vents, roof vent flashings, box vents, t-top vents, house roof vents, solar powered wholehouse and garage vents, dryer venting, bath vents, laundry vents, kitchen hood vents, dryer roof vents and other roof vent systems. How much venting do I need? See Vent Calculations for further detail. And we also have lots of Roof Vent Do-It Yourself Installation Information, and Roof Ventilation Basics. We are happy to drop-ship orders right to your job site. Be sure to call for special pricing on large-job orders, custom roof vents or to discuss an item you do not find in our online catalog. During the summer, when the outside temperature is typically much higher than the inside temperature, attic ventilation serves to help cool your house. An unfinished attic builds up a tremendous amount of heat, and if that heated air has no place to escape, it can make the inside of the house much warmer or cause an air conditioning system to work much harder to cool the house. There are a wide variety of sources of moisture in a home, from the building materials themselves to normal everyday activities. For example cooking, bathing and washing clothes all release gallons of water vapor into the air. That vapor isn't a problem inside the average home because the temperature inside the home is warmer than outside for much of the year. Warm air holds more moisture in the form of water vapor than cool air. Building codes specify the minimum amount of attic ventilation needed in a new home to prevent winter moisture buildup, but your summer needs are much greater. Also, older homes were often built with inadequate attic ventilation at least by today's standards and may need to be retrofitted with proper attic ventilation. A good attic ventilation system is designed for summer needs and moisture. It includes two types of vents: intake vents are placed along the soffit to allow fresh air into the attic, and exhaust vents are installed in the upper third of the roof to allow attic air to escape. The object is to create a continuous "wash" of air along the underside of the roof sheathing. The rule of thumb for summer months is that you should provide enough ventilation to completely change the air in your attic every six minutes. Accuvent products inside-attic ventilation baffles are excellent. Gable Vents can provided in most any shape to compliment house architecture. Gable vents are installed in a gable wall just below the peak of the roof. 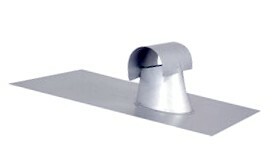 These vents are cost effective yet provide a lot of net free vent area. They can function as both intake and exhaust vents, depending on the roof design. Soffit Vents, Under-eave vents are made usually with a screen or perforated aluminum panels to keep insects & rodents out and allow good air flow. 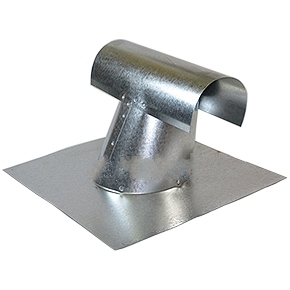 Rectangular Soffit Vents are cost effective and designed to fit the space between rafters and roof. They can provide a lot of intake air with 55 to 78 sq.in. of net free area. They perform best when used together with vent tubes (to prevent attic insulation from blocking intake). Standard sizes are 22.25" wide x 3.5" or 5.0" high and designed to fit standard 24" rafters. They are sold 50 per bundle. These are easy to install. Simply cut rectangular holes in the soffit and screwing the vent over the hole. CALL FOR PRICING. 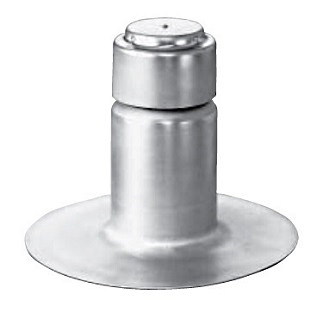 Circular Soffit vents range from 1" to 8" in diameter. 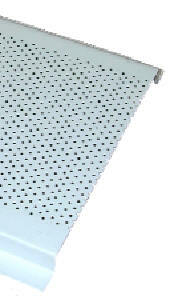 They are installed by drilling holes in the soffit and pressing the vent into the hole. Generally, these do not provide anywhere near sufficient intake and suffer from blockage by attic insulation. Static vents, also known as roof line or eyebrow vents, consist of a sheet metal cylinder with a flashing collar and a metal hood to keep rain out and an inside bug screen.. They are installed in rows along the face of the roof by cutting holes in the roof, nailing the flashing collars to the roof sheathing and shingling around the vents. Their effectiveness depends on how many are installed; probably their greatest disadvantage is that like any roof penetration, they may leak. Ridge vents are installed along the peak of the roof and replace the ridge singles. More advanced ridge vents, such as VariVents, offer superior performance together with excellent rain resistance. Wind Powered Ventilators are turbine vents or Aura vents. They are installed like roof line vents along the face of the roof. When the wind blows, it spins the turbine, which in turn draws air up out of the attic, or in the case of Aura vents, the wind creates negative pressure pulling the air from the attic. Their effectiveness, largely depends on whether the wind is blowing or not. Fan-driven ventilators or Powered Vents are powered by electricity and usually controlled by a thermostat in the attic. They are very effective, but since they are motor-driven, the extra cost of running them partially offsets the energy they conserve, and motors can have some maintenance issues. The number of vents you'll need depends on the type, size and effectiveness of the vents. 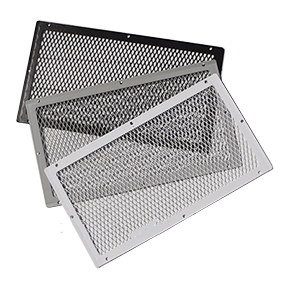 Vents are rated according to their square inches of net "free vent area" (FVA) in other words, the net size of the flow through opening. 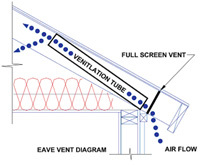 You can't just measure the size of the vent to find the FVA because the open space is reduced by louvers and by the screen mesh that covers the opening. Most manufacturers provide both net FVA ratings and ventilation recommendations for their products. In order to estimate, you'll need to know the total square footage of your attic (not including eaves) and possibly the slope of your roof.